This is one of our dogs, Lexie, making herself comfortable on a luckless chair, fortunately already so battered I think it was beyond caring. No, I have no idea how she managed to get into that position, though there are ladies of the night that would pay a small fortune for her secrets, I’m sure. 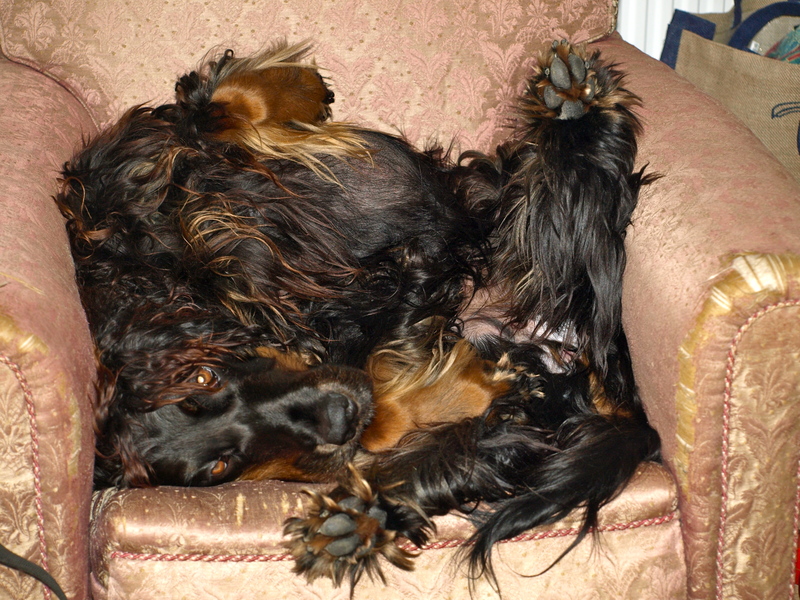 Perhaps I should have called her Miss Pretzel, but we settled for Lexie – she and her big pal Hamish are Gordon Setters, therefore from Scotland originally, so we were trying for a Scottish sort of feel. The naming was very quickly (and I feel unreasonably) followed by several major stars calling their offspring Lexie, which does I suppose make a change from Apple or Peaches Fifi Trixiebelle. While appreciating the compliment, our Lexie wishes to point out that she is the original. She also wishes to point out that while Fifi Trixiebelle is undoubtedly a good name for some dogs, if anyone ever tries to apply it to her she will sue. Being an original, Lexie was determined from an early age (seven weeks) to be impossible to train. Hamish, a year older, was a darling boy who never did anything wrong. He even learned to pee on command, which he was particularly proud of. Lexie, on the other hand, felt that peeing anywhere she didn’t particularly want to was beneath her… along with any other sort of command I might be tempted to try to inflict on her Person. This may explain why I have a stack of dog training manuals a yard high, and have watched every single episode ever made of Dog Borstal and the Dog Whisperer. We also went to the local training class, where we caused much hilarity as we bounced and fought our way around while all the nice doggies paid attention to their masters and did as they were told. Paying attention, Lexie explained, was not what a Setter was supposed to do. And anyway, I was nowhere near as exciting as all the other stuff that was going on. We persevered, and perspired, anyway – all sorts of treats were tried, but Lexie is not much of a one for food treats. She is the sort of dog that lies on her back while you peel her a tiny morsel of fillet steak. She might eat it, if she’s in the mood. But she might not. However, grannies are not without their wiles and I discovered that tiny dog toys, stowed up my sleeve, were guaranteed to catch her eye… This improved things no end! However, there was one troubling issue that we struggled with – one that began when Lexie was six months old and we were out for a walk in our local fields. Both dogs were off the lead, happily sniffing around as we headed down towards the small river. I didn’t, unfortunately, spot the sick pigeon in the ditch but Lexie sure did. With cries of delight she pounced on it. I mentioned she loves dog toys – well, to a bird dog, a bird is the ultimate dog toy, unfortunately, and that was the day she found out. I dived into the ditch after her while Hamish fretted and fussed at the top and watched us wrestling for the pigeon – feathers everywhere… I won, to her disgust, and watched the pigeon wobbling away into the breeze with much relief. After that, we very quickly discovered just how dog-proof our back garden fence wasn’t. No sooner did we mend one hole, than she found another. And if we went to the playing field to throw balls, or toys, she would sooner or later run for the gap at the end and that was it. Each time she would scamper happily away and we would see her in the distance, streaking over the fields, searching for another pheasant that might be kind enough to come out to play. The last straw was when our neighbour remarked in passing ‘I nearly ran over your dog yesterday… She just came out of the field onto the road…’ That same day, we bought a large roll of small-mesh chicken wire, 6ft high, and surrounded the back garden. We stood back proudly – Lexie snickered, and leaped over the five foot gate. My hubby and I just looked at each other askance… we hadn’t even realised she could jump that high. The following day, with a new, seven foot gate in place, training began. With advice from the experts, we started with a normal leash, practising recall over just four feet or so, moving to a longer and then an extendable lead as she got better at returning. Eventually we got to a long line – probably about ten metres or so. By this time she was nearly a year old – it wasn’t a fast process. Finally, someone mentioned spray collars. These fit round the dog’s neck like an ordinary collar, but have a little box that is located just under their chins. You fill them with water, or lemon-scented stuff, and if you press a button then this is squirted in a fine spray into their noses. There were three settings – small, medium and large spray, which sounded just perfect to us as the final guarantee… We bought one, and took Lexie out to the playing field, where we at last took the lead off. God knows, we tried to keep her busy and interested, and the training seemed to be paying off – but in the end the lure of the pheasant was just too strong and she made a break for the gap. Panicking, I hit all three buttons on the spray collar at once and an amount of water roughly equivalent to the Niagara waterfall squooshed up Lexie’s nose in an instant. Peering from a distance, all I could see was that the dog had disappeared into a fine mist… I held my breath. A heartbeat later, a soggy dog ran very fast back towards mum and dad, clearly not keen to go further in the direction of whatever the hell had just hit her. Feeling terribly guilty, we lavished praise on our prodigal pup. Was she cured? Well, nearly. A few more, slightly less extreme squirts were needed, and even now I don’t walk her off lead anywhere that gives her too much scope to bolt. Nowadays, seven years on, she is much more inclined to want to be with her family – thank goodness, but I would never like to take the chance of some passing pigeon inviting her to play! from each other. If you’re interested feel free to shoot me an email. I look forward to hearing from you! Terrific blog by the way!